It’s not your average BBQ, but it doesn’t take long before safely cooking and cleaning your Kadai Fire Pit becomes second nature. We’ve found these tips for Kadai BBQ cooking and maintenance to be incredibly helpful, to ensure that you make the most of your Kadai Fire Pit. 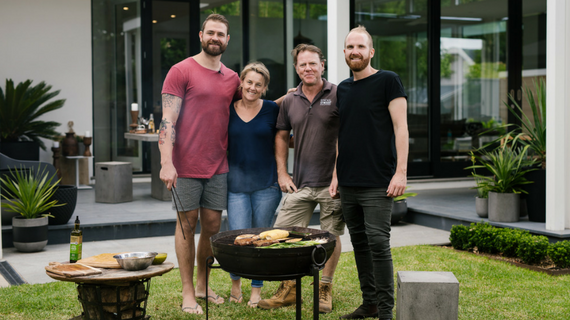 Adelaide boys and former contestants on Channel 7’s My Kitchen Rules, Tim Attiwill and Kyle McLean achieved record-breaking, perfect scores for their meaty main course in 2017. Since then they’ve joined us for a cooking demonstration that will show you how to make the most out of our Kadai Indian fire pits. We have always been fascinated by the ancient traditions of the Eastern world and the stories that follow their artefacts into the modern world. After researching the products we wanted to source for Sticks + Stones Outdoor, we realised India has an unbeatable reputation for these premium quality products; not to mention we absolutely adore the people, culture, and the food. We knew immediately that we had to visit this incredible country, to handpick truly special pieces and bring home the stories of these products, to share with our customers. We know that outdoor living spaces can be easily neglected. We tend to think more about our interior decorating, and often overlook what’s happening in our outdoor space. However, our outdoor areas can add immense value to our houses, providing us with various health benefits, and a functional and beautiful space to entertain our family and friends. Growing plants can seem like a daunting task if you haven’t had previous success, but with some knowledge of your products, forward-thinking and simple maintenance, it can turn into an extremely rewarding experience. Here’s a quick guide as to what plants are durable, and best suited, in the Australian climate, the benefits of concrete pots and some useful tips for soil maintenance.